JW Filshill was named the best wholesale business in Scotland at the prestigious Scottish Wholesale Achievers awards, held at the Sheraton Grand, Edinburgh, on 31 January. The team from JW Filshill celebrate being crowned Champion of Champions. 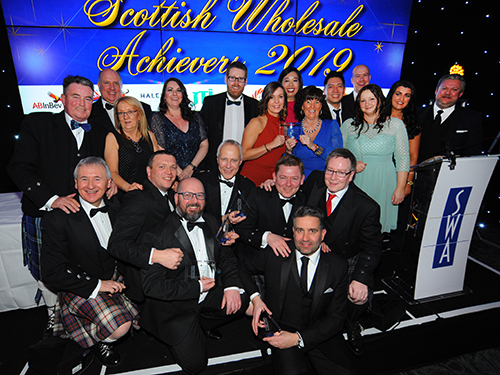 Now in its 17th year, Achievers recognises professionalism and excellence across all sectors of the wholesale industry in Scotland, rewarding suppliers as well as wholesalers. In addition to winning the Champion of Champions accolade, JW Filshill was triumphant in three other categories: Best Delivered Operation – Retail, Best Symbol Group, and Best Licensed Operation. Another Unitas Wholesale member, United Wholesale (Scotland) was also a winner, claiming Best Marketing Initiative for its ‘Summer of Sport’ campaign to drive a comprehensive wholesale and retail sales and marketing activation across all areas of its business. Bidfood Scotland was also celebrating, with two award wins: Great Place to Work and Best Delivered Operation –Foodservice, the latter as joint winner with Lomond Foods. Booker Shawfield was another double award winner, taking the Best Cash & Carry title and also Employee of the Year for Craig Shand, stock control & replenishment supervisor. In the suppliers’ award categories, Linda Fraser of Nestlé was named Supplier Sales Executive of the Year, while Quorn Foods in partnership with Scot Serve won Project Scotland. AG Barr came out on top in the Best Overall Service award, judged by members of the SWA voting each month for the shortlisted suppliers over a four-month period. Meanwhile, a new award for Achievers 2019 – Best Foodservice Supplier – was won by Unilever Food Solutions.